We all know how to buy a TV. Just open the newspaper, find the best price and go get one. The customer then goes into the store, AD in hand, and says "wrap it up". However, the best price may not be the "best deal". Important things to consider are sometimes overlooked. Before you head out with cash-in-hand to buy a TV, whether it be a small one for the bedroom or that large screen for the living room, check out the following shopping tips. Many times a customer will buy a TV get it home just to return it because it just doesn't quite fit in the entertainment center, on the TV stand, or on the wall space. The key takeaway here is to make sure you measure the required space for your TV. Leave at least a 1 to 2-inch leeway on all sides and several inches behind the set in order to make it easier to install your TV and to allow for adequate ventilation. Also, make sure you have extra space for the installation of any cable and/or rear panel audio/video connections, once the TV is in place. Leave enough room to move it so that cable connections can be easily installed or uninstalled. Remember to bring those measurements and tape measure to the store with you. Make sure the room has adequate viewing space. The temptation to get the biggest screen possible is hard to pass up, especially when the salesperson hypes it. However, you must have the proper distance between you and the TV to get the most pleasing viewing experience. For a 32-inch LCD TV, you should give yourself about 4 feet to work with, for a 40-inch LCD TV give yourself about 3 feet and for a 55-inch TV you should have about 7 feet to work with. You should have at least 8ft to work with when installing a 65-inch set. This doesn't mean you have to view from these distances but gives you enough room to adjust your seating distance for best results. Also, optimal distances will vary according to the aspect ratio of the screen, and also if you are viewing high definition or 4K content (that has more detail) or standard definition content. A handy tool to check is a Viewing Distance Calculator. If you are upgrading from an old analog to an HDTV or 4K Ultra HD TV, you can sit closer to the screen as there is more detail. If you are building a TV viewing area or home theater room from scratch, even if you plan to do your own construction, consult a home theater installer or a contractor that specializes in home theater to get an assessment of the room that the TV will be used in. Factors such as the amount of light coming in from windows, lamps, room size, acoustics, etc... will certainly be a major factor for the TV (as well as for the audio setup). Here is one tip that is definitely overlooked! If you plan to buy a TV and take it home with you, make sure your Vehicle is large enough to transport it. With cars being smaller these days, many cannot fit any TV larger than 32 or 40-inches in the front seat or the trunk. Even though some compact cars can fit a 40-inch set on the back seat, be careful when loading and make sure the set is secure and doesn't bounce around creating a potential safety hazard or cause damage to the TV. If you have an SUV, you should be able to accommodate up to a 40 or maybe a 50-inch set without too much trouble. It is recommended that you have enough room in the back of your car to transport the TV vertically. If the packaging support is not adequate, bending or other damage may occur (from bumpy roads) if the TV is laid flat. However, even if you have room to take the TV with you, many stores offer free delivery on larger screen TVs. Take advantage of this. Don't risk a hernia trying to lift a big screen upstairs. If you take the set home yourself, you are out of luck if you damage the set. If you let the store deliver it, they take all the damage risk. If you haven't shopped for a TV in a while, get familiar with the types of TVs you have to choose from. CRT (picture tube), rear-projection, and Plasma TVs are no longer being made. Your choices are LCD and OLED TVs. LCD TVs employ a back or edge light that passes light through LCD chips in order to display the image on the screen. With OLED TVs each pixel emits their own light, which means that they can be individually turned-on, dimmed, or turned off. LED and QLED TVs are sub-types of LCD TVs. LED TVs are LCD TVs that use tiny LED light bulbs in the back or edge-light system, while QLED (or Quantum) TVs are LCD TVs that have a layer of Quantum Dots between the backlight and the LCD layer designed to enhance color performance. Screen Surface: Check to see if the TV has a matte or glossy screen. Matte screens have an anti-glare coating that reduces reflections from light coming from windows or lamps. Glossy screens can magnify and distorted light that reflects towards your seating position. Matte screens are better for daylight viewing, whereas glossy screens do better in a darkened environment. Black Levels: Take note of the black levels when the TV is on. Deep black levels not only contribute to contrast but can enhance color. If the TV is an LED/LCD or QLED TV, check to see if there is any "spotlighting" in the corners or unevenness in black levels across the screen surface. If you are looking for a TVs that have a more even black level across the screen surface, and you have a light controllable room (you can make the room dark), look for a LED/LCD TV that features Full-Array Backlighting or an OLED TV. Flat or Curved Screen: Curved Screen TVs are attractive looking at the store, but buyer beware. Keep in mind how many people will be viewing at the same time. This means that unless the TV has a very large screen, only one or two people will be viewing from within the curve. Curved screens distort light reflected off the screen. If you are watching a movie that has black bars on the top and bottom of the bars will be slightly curved rather than straight. If you are planning to mount the TV on a wall, the sides will stick out. Display Resolution: This is the most well-known factor used to hype picture quality. Screen resolution is expressed pixels and reflects how much detail the TV can display. For HDTVs, 1080p (1920x1080) is the default standard for native display resolution. However, on many TVs with screen sizes 32-inches and smaller, the display resolution might be 720p (usually expressed as 1366x768 pixels). For Ultra HD TVs, the display resolution is expressed as 4K (3840 x 2160 pixels). The key thing is to see if the displayed image is detailed enough for you. In many cases, unless you are close to the screen, you may not be able to tell the difference between a 1080p and 720p TV. Depending on the content source and your own visual acuity, you may start to notice a difference beginning with screen sizes 42-inches and larger. 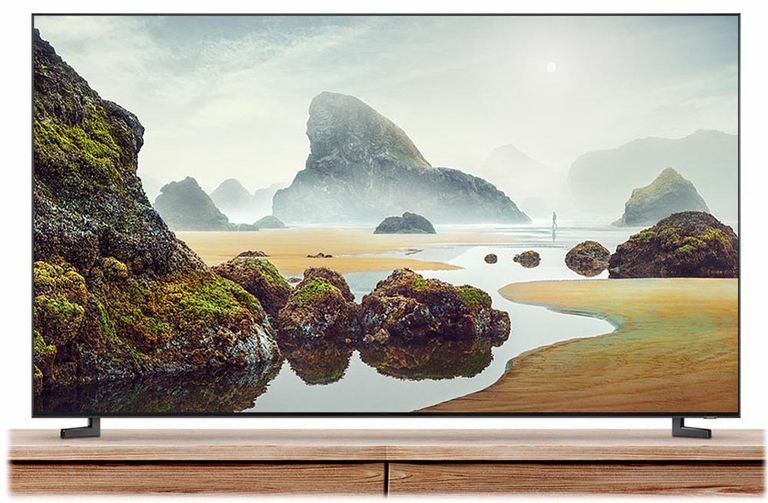 Although the large majority of sets for sale are 4K Ultra HD TVs with screen sizes as small as 40-inches, depending on your seating distance, you may not notice a difference between 1080p and 4K. However, just as with the difference between 720p and 1080p, content, seating distance, and visual acuity will also be factors. For many, the 1080p-4K difference may start to be noticeable with screen sizes 55-inches or larger. When it comes to displaying resolution, you need to take a good look. Scaling: With the advent of HDTV (720p, 1080i,1080p) and Ultra HD TV (4K), scaling ability is also an important factor to consider when buying a TV. Analog video sources, such as VHS and standard Cable, do not look as good on an HDTV (and definitely not as good on a 4K Ultra HD TV) as they do on an analog TV. There are several reasons for this. Scaling is a process where a TV, DVD, or Blu-ray player tries to eliminate the defects in a standard resolution video image to make it look better on an HDTV, but not all HDTVs perform this task well. Also, even with the best scaling capability, you cannot magically transform a standard resolution image into a true high definition image. When considering an HDTV or 4K Ultra HD TV purchase, also look at how well the TV looks with both high definition and standard definition content (for 4K TVs definitely consider how 1080p and lower resolution content looks). See if you can get the dealer to show some standard definition content on the TV before you buy it. Keep in mind that if you buy a 4K Ultra HD TV, most of the content you will be watching on it will be upscaled from 1080p or lower resolution source signals, but there is an amount of 4K content available to watch. Of course, as the screen size gets larger on either a 1080p or 4K Ultra HD TV, the quality of a standard definition image keeps going down. Don't expect your VHS tapes or standard Cable signal to look very viewable on a screen larger than 50-inches unless you have a long screen to seat viewing distance. HDR (4K Ultra HD TVs): Another picture quality feature to consider in a 4K Ultra HD TV, is the inclusion of HDR on some models. TVs that have HDR (High Dynamic Range) compatibility can display increased brightness and contrast range, which also provides color quality from compatible content sources. Depending on the TV brand and model, some HDR compatible TVs can also display enhanced brightness, contrast, and color from standard video sources via HDR-effect settings. However, to make things confusing, there are several HDR formats, and not all HDR-enabled TVs are compatible with all of them. Check to see if the TV has a least one set of audio/video inputs and one set of audio outputs. They are usually mounted either on side or back, or both. For audio, TVs have built-in speakers, but with TVs being so thin now, there is very little interior volume to house a good quality speaker system. Sony's OLED TVs actually use the screen to display the images and produce the sound. Some TVs also provide several audio processing options, but for a satisfying listening experience, especially in a home theater environment, an external audio system is definitely preferred. Most TVs provide either a set of analog or digital optical audio outputs, or the HDMI Audio Return Channel feature, or all three. Check for these options even if you don't have an external audio system right off the bat. On the video side, all of today's TVs have HDMI inputs for attachment of HD-Cable/Satellite Boxes, Blu-ray Disc players, Game Systems, and Network Media Players/Streamers. Most TVs have RCA-composite and component video inputs, but they are most likely shared. This means you can't plug in a composite and component video source into the TV at the same time. Even if you don't have all the latest gear, get a TV has enough input/output flexibility to add future compatible components. Most TVs available now are Smart TVs, which means they connect to your router and the internet. These sets usually have Ethernet connections and built-in WiFi for this purpose, although some sets may only provide WiFi. Smart TVs not only can you access TV programming and movies via the TV's tuner, via cable/satellite box, or Blu-ray/DVD players, but also via the internet and/or local network-connected PCs. If you are considering the purchase of TV that offers 3D viewing capability, unfortunately, 3D TV production was discontinued as of the 2017 model year, but you may still find some models available used or on clearance. Also, if you are still considering 3D, many video projectors provide this viewing option. One important thing to point out is that all 3D TVs can also be used for normal TV viewing as well. Keep in mind that in order to view 3D, you need special glasses. Passive Polarized: These glasses look and wear much like sunglasses. TVs that require this type of 3D glasses will display 3D images at a half resolution of a 2D image. Active Shutter: These glasses are slightly bulky since they have batteries and a transmitter that syncs the rapidly moving shutters for each eye with the onscreen display rate. TVs that use this type of 3D glasses will display 3D at the same resolution as 2D images. Some TVs may come with one or more pairs of 3D glasses, or they may be an accessory that must be purchased separately. Active glasses are more expensive than Passive glasses. Also, be aware that when buying a 3D TV, that you also need 3D source components and content to take full advantage of 3D viewing. This means that you will need one, or more, of the following: A 3D Blu-ray Disc player, 3D Blu-ray Discs, and/or 3D capable Cable/Satellite Box and services offering 3D programming. There is also some 3D content available via internet streaming, such has Vudu 3D. When shopping for a TV, make sure the remote control is easy for you to use. Have the salesperson explain it to you if you are not sure of some of the functions. If you need to control several items with the same remote, check to see if it is a universal remote and or it is compatible with some of the other components you have. Also, check to see if the remote control is backlit. This means that its buttons light up when you press them. This is practical for use in a darkened room. In addition, see if most of the TV functions can also be controlled on the TV. The controls may be placed on the bottom or on one side. A few TVs may have the controls on top of the bezel. This can be very important if you misplace or lose your remote. Exact replacement remotes are not cheap and generic universal remotes may not control all the important functions of your new TV. However, if you find that you do need an exact replacement remote control, a good source to check out Remotes.com. Another remote option for many TVs is an availability of downloadable remote control apps for both Android and iPhones. This definitely adds more control convenience. Here are some final things to consider when purchasing a TV. Needed Accessories: Don't forget additional accessories you might need, such as coaxial, audio-video and HDMI cables, power surge protector, and any other items that you will need to complete the installation and setup of your TV, especially if you are integrating it with a home theater system. Extended Service Plans: Consider an extended service plan on a TV more than $1,000. Although TVs rarely need repair, those repairs can be costly. If something happens to an LCD or OLED screen, the entire set would probably have to be replaced, as these units are basically a single, integrated, piece. Extended service plans for larger screen TVs usually include home service and may even offer some type of loaner while your set is being repaired. The Video Projector Option: While TVs are available in very large screen sizes (up to 88-inches), if you want really large, more cinematic viewing experience, a video projector might be the best option for you.